Construction has commenced on a new 55-storey residential tower, 16-screen cinema complex, multi-storey car park and retail expansion at Ibn Battuta Mall in Dubai. Developer Nakheel said in a statement that it had awarded a contract to Dubai-based National Gulf Constructions for enabling works at the site, located on the southern side of the mall, adjacent to The Gardens community. The new US$231 million residential, retail and entertainment development includes a 55-floor residential tower - Ibn Battuta Residences 2 - with 279 apartments, pool deck, landscaped grounds, retail space and multi-storey car park. Plans also call for a 16-screen dine-in cinema complex, with its own multi-storey car park featuring almost 1,400 spaces and directly linked to the mall, and a retail expansion with 53,000 square feet of outlet space and more than 600 new parking spaces. A health and wellness centre featuring swimming pools for adults and children, a fitness club and café, will occupy the top-level of a four-storey parking podium housing 515 spaces. The complex will also boast a 32,000 square feet landscaped park with a 200-metre jogging track, children’s play area and shaded seating. 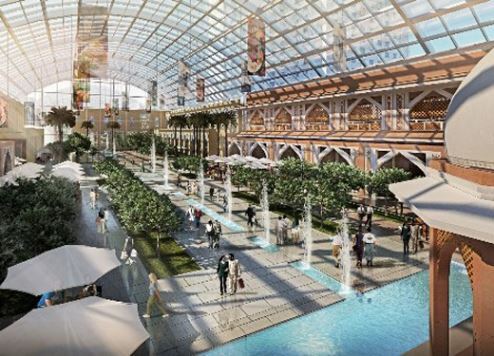 The new projects are part of Nakheel’s phased expansion at Ibn Battuta Mall, which is transforming the area into a sprawling retail, residential and leisure hub. Phase one, comprising a 300,000 square feet retail extension, a 210-metre link to the Dubai Metro and a 372-room hotel, opened last year. Subsequent phases will include a one million square foot mall featuring a retractable roof for year-round shopping and dining, and an additonal hotel.